I’m a child nursing student in the UK, and I have a bit of an odd request. 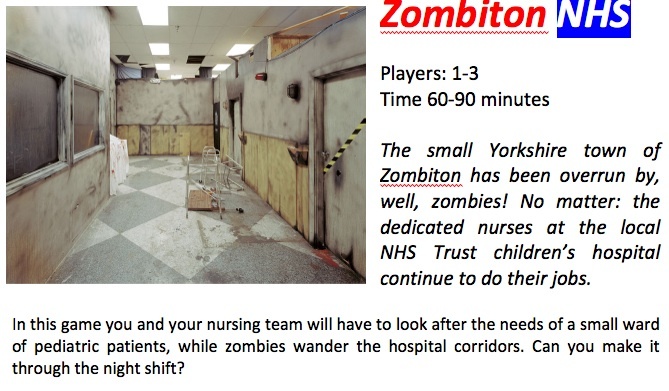 We recently played a game in class on running a hospital ward that I found particularly interesting and useful. I also rather like zombies, and have played a few zombie-themed games. Is there any way to combine these two interests? After all, the National Health Service—which I hope to join soon as a nurse—needs to be prepared for the zombie apocalypse. Well, how could I resist a challenge like that? It became even more interesting as we discussed the design requirements. No one could get hurt in the game—after all, the patients are children. Instead, zombies simply cause “regrettable incidents” (which require that appropriate NHS paperwork be filled out). Nurses themselves can attempt to deescalate the shambling undead, and send them to the waiting room downstairs. The various patients in the ward have different, randomly-generated needs related to their general medical conditions. Some of these can be addressed directly by nursing staff, but others require searching the zombie-infested hospital for medication, equipment, or supplies. Part of the game system is inspired by, and helped shape, the system I used for my humanitarian crisis game. The final result is Zombiton NHS. The game rules, map, and cards are all available for download below. As for my co-designer, she has since graduated and is soon to join the staff of a major children’s hospital–where she’ll no doubt both look after paediatric patients AND, if necessary, keep the undead at bay. If the rules are unclear, email me for clarification. I’ll post a rules update and/or FAQ if necessary.